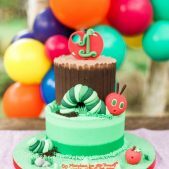 We love The Very Hungry Caterpillar theme, it makes a great dessert table and party inspiration for your little ones. Best of all our cakes are even more delicious than any of the food the hungry caterpillar eats! 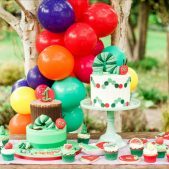 As well as a magnificent cake with a hungry caterpillar sitting proudly on top, our dessert tables in the hungry caterpillar theme are adorned with a rainbow of colourful and delightful treats. 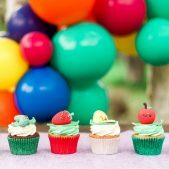 Our cupcakes are crowned with colourful replicas of everything on the hungry caterpillars menu, so with our help you really can bring your child’s favourite story to life. 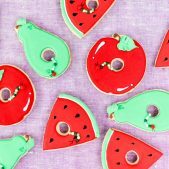 Add your own mark with colourful balloons and watch your hungry children’s faces beam with joy at the sight. Let’s face it, who doesn’t love the caterpillar’s journey from egg to beautiful butterfly in Eric Carle’s colourful picture book? The adorable caterpillar eats his way through a whole host of colourful treats and transforms into a beautiful butterfly. 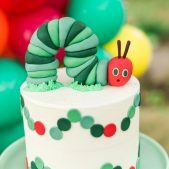 Our hungry caterpillar themed cakes and desserts will transform your party into a fabulous feast for the eyes, and will fill those tummies too as they munch through our delicious treats! Our cute cake pops are a big hit in party bags. Every hungry child gets to take home a delicious hungry caterpillar treat. We know your hungry children will think it’s the best birthday surprise ever, and we promise they won’t turn into butterflies!